The Anterior Cruciate Ligament (ACL) in humans is known as the Cranial Cruciate Ligament (CrCL) in dogs. This ligament is an important stabilizer of the knee, and in both people and dogs, this ligament may tear. Most owners do not know exactly how the CrCL tear occurred, but they notice the gait abnormality in their pet. This CrCL ligament tear needs to be repaired in dogs that lead an active life. The CrCL repairing technique that we usually recommend at Sun Valley Animal Center is the Tibial Plateau Leveling Osteotomy (TPLO) procedure. In our hands, we have found few procedures with a success rate as high as that of the TPLO. Dr. Randy Acker began doing TPLOs in the early 1990′s, after learning the TPLO technique from Dr. Barclay Slocum who developed this procedure. Dr. Randy Acker has performed over 6000 TPLO procedures, has more than 25 years of experience perfecting his TPLO technique, and has taught at the Synthes TPLO course. Dr. Randy Acker is passing his knowledge and experience on to his daughters, Dr. Amber Acker-Sanborn and Dr. Maggie Acker-Buck at Sun Valley Animal Center. Clinical signs of CrCL tear in dogs range from intermittent limping to acute complete non-weight bearing lameness in the hind limb. CrCL tears can be partial, complete, or complete with a damaged meniscus. A dog with a partial CrCL tear may be intermittently lame, and might be hesitant to flex the knee. They may sit with their leg out to the side. A dog with a complete CrCL tear is often 3-legged lame for a few days with some improvement as the inflammation resolves. The last phase of a tearing CrCL involves damaging the meniscus, which will cause the dog to bear very little weight on the leg. Most partial CrCL tears will progress to complete rupture. Bilateral CrCL tears are common due to underlying etiology. Because dogs have more cranial tibial thrust than humans, they usually do not heal with rest. They may function well enough to get along with conservative treatment, but they will continue to be lame without knee surgery. Most patients arrive at Sun Valley Animal Center in the morning and go home the same evening following the TPLO procedure. We rarely hospitalize our patients overnight. A complete physical exam and pre-operative blood work are performed on all patients to evaluate their general health, and to ensure that they are good candidates for anesthesia and surgery. Radiographs are taken of the hips, low back, and both knees. With this information, the best treatment for your dog is determined. Because some dogs have multiple problems, we ask that you are present for the morning exam and the decision making process. Anesthesia for the TPLO procedure is safe. Advanced pain management for TPLOs at Sun Valley Animal Center includes an epidural and a femoral block followed by local block while under general anesthesia. The medial meniscus is carefully examined and treated. 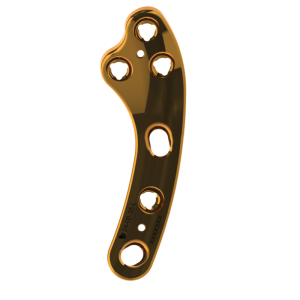 During the TPLO procedure, the tibia is cut, rotated, and plated with a locking plate, which changes the biomechanics of the leg and makes the CrCL unnecessary. Vessels are sealed throughout the procedure and all of the sutures are under the skin so there is no need for bandaging or suture removal. Patients are able to go home with owners on the evening of their surgery. Aftercare is easy. Following our TPLOs, we request two weeks of restricted activity followed by short leash walks up to two months. We will call to check in with you during the healing process. Recheck appointments and Physical Rehabilitation are recommended, but only required in rare cases. At two months, off leash activity is usually permitted. We have a 95% success rate due to years of experience with the TPLO procedure, high quality instrumentation, and locking plates. 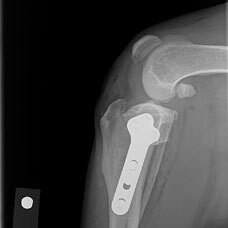 Complications are rare but can include infection at the surgical site, patellar luxation, and implant failure. Infection rate has been mitigated with our new silver coated BioMedtrix Locking Plate that was developed by Dr. Randy Acker in conjunction with BioMedtrix. Most dogs return to normal or near normal function within 6 months of surgery. Following TPLO surgery and the healing period, patients can return to field trial, running, work, or any other activity that they performed prior to surgery. The package prices for our TPLO procedures are very affordable. The quoted price is all inclusive with no extra fees attached. Please call Sun Valley Animal Center at 208-726-7777 for a quote and to schedule a TPLO with one of our doctors.